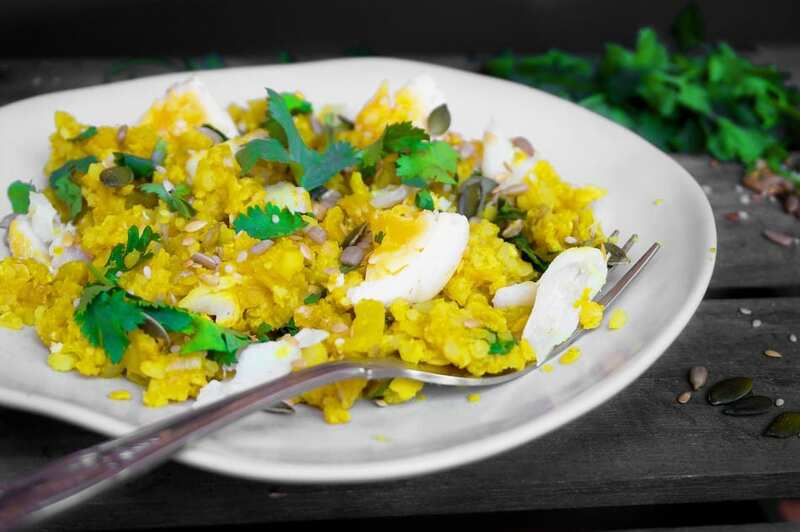 The simple, yet delicious Kedgeree dish is a recipe that has remained popular since the British Empire times and of course, draws inspiration from India. To this day, it’s a firm favourite for many – including myself. So how may a man living a Primal lifestyle still be able to enjoy a dish that’s well know for it’s grains? Well my Primal friends, like most of our recipes, we adapt it to suit our lifestyle. We simply get rid of the grains and replace them with Primal friendly ingredients – such as lentils, cauliflower rice and chunky seeds. Now, if you’ve read my book then you’ll know that by following a Primal (and paleo) lifestyle we avoid CARBs. However, whilst lentils may be considered a carbohydrate, they’re a natural and complex carbohydrate which is why they fall towards the bottom of the GI index. Again, if you read my book then you’ll see that I’ve even included lentils in my ‘top 40’ list for all my vegetarian friends as they offer one of the richest levels of protein that you can get from a plant. Lentils are actually a very wholesome pulse. They contain a good amount of fibre, folate, iron, manganese, potassium, zinc, phosphorous, magnesium, copper, vitamin B1 (thiamin) and vitamin b6 (pantothenic acid). I don’t personally eat them as I get plenty of protein from meat and poultry, but if you are a vegetarian or vegan however, then lentils should be in your kitchen cupboards as they’ll most definitely help to fill some nutritional gaps in your diet. 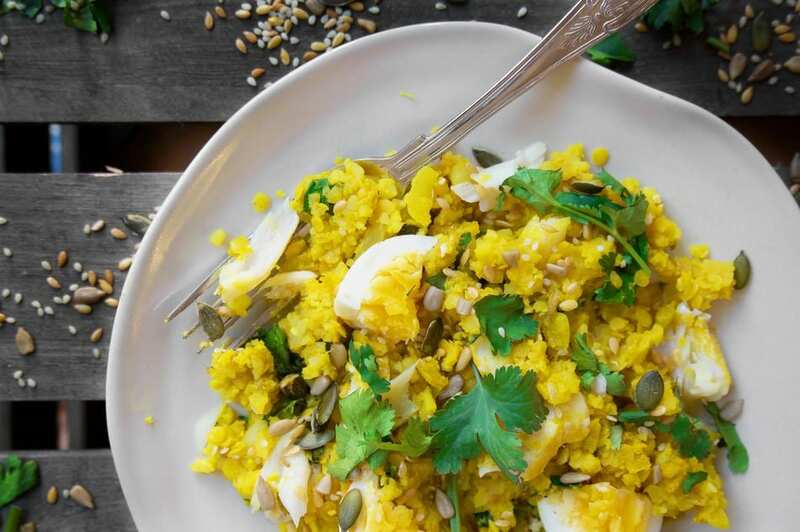 If you’ve had kedgeree before then you’ll know that it’s not particularly a very unhealthy dish, however, that’s not to say that it can be made a lot healthier. 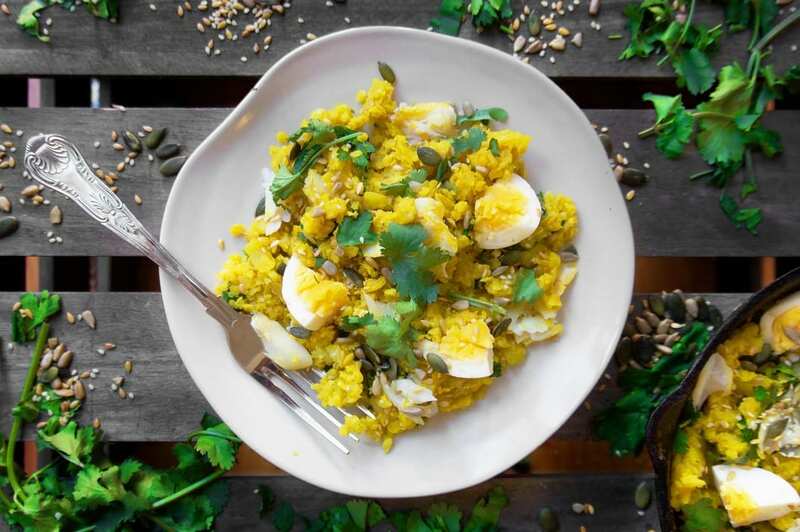 My take on the classic kedgeree dish makes it lower in carbohydrates, dairy free and because we’re using healthy and complex carbohydrates, you’re GI levels won’t spike. Not to mention that this dish is full of healthy fats and nourishing, whole ingredients that your body will thank you for. 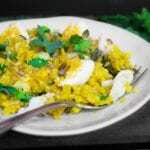 The spice from the cayenne pepper also adds a nice heat to the kedgeree which really compliments the overall flavour. It’s not overly spicy, however if you’re not a fan of spice then you can simply leave the cayenne pepper out and instead add a sprinkle of black pepper to still allow that kick. My Primal take on the classic Kedgeree dish. Low carb, dairy free and super nutritious. 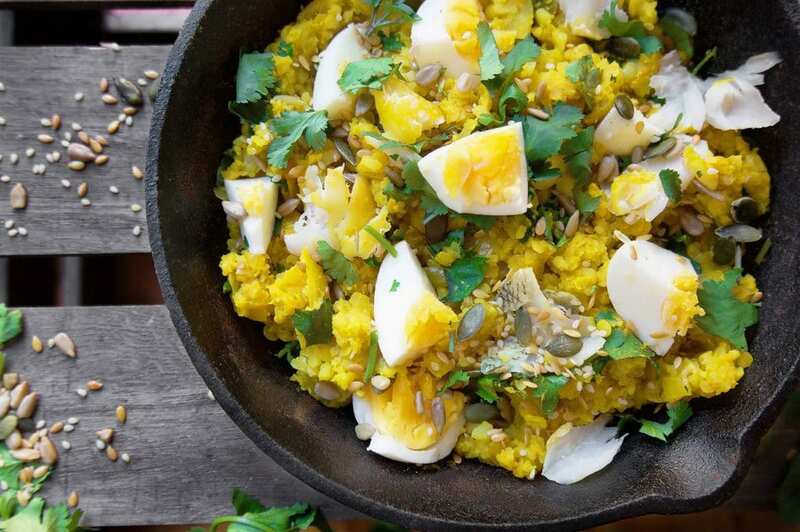 Go on, give my fiery low carb kedgeree a go! Begin by grilling your smoked haddock fillets for 8-10 minutes. In a saucepan, bring your eggs to boil for 8 minutes. Once done, drain the hot water and pop the eggs in a cold bowl to cool down before peeling. In a pan melt a tsp of coconut oil and add the chopped onion and garlic and fry until golden brown. Once done, add the spices and stir for a few minutes. Add the cauliflower rice, lentils,mixed seeds and coriander. Carefully stir and whilst stirring, add the lemon juice. Once everything is cooked, slice the boiled eggs and flake the haddock. Serve up the kedgeree and then top each plate with a fair serving of haddock and eggs. Top with more coriander if desired and serve.